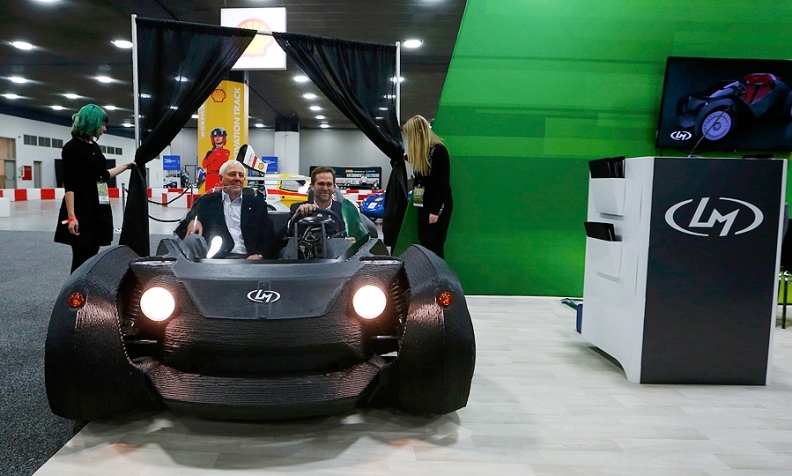 CEO and founder of Local Motors John Rogers (driving car) and Milt Peterson, of Peterson Cos., showcase the 3-D printed Strati at the Detroit auto show in January. The world’s first fleet of 3-D printed cars is on its way, startup Local Motors said, but you won’t see a mass-produced 3-D car anytime soon. The technology is nothing new to the automotive industry. Most major automakers have already been using 3-D printing in the prototyping phase for years. Toyota, for example, has been using 3-D printing for rapid prototyping at its North American operations for nearly 20 years, Toyota spokesman Brian Watkins said. “We use the technology primarily for prototype parts and ‘proof of concept’ applications, but not for production parts or vehicles,” he said in an email. GM spokesman Klaus-Peter Martin said 3-D printing isn’t used much outside of prototyping because it just can’t match the speed of traditional assembly. Local Motors said its low-speed EV is scheduled to debut in the first quarter of 2016 and will be priced between $18,000 and $30,000. The startup, based in Phoenix, Ariz., garnered attention earlier this year when it 3-D printed an entire concept vehicle at the Detroit auto show. Another startup out of San Francisco, Divergent Microfactories, also urges that 3-D printing is the wave of the future in automotive manufacturing. The company is using 3-D metal printing to develop alloy connectors that join carbon fiber tubing in the chassis of its 3-D printed supercar, dubbed the Blade. Ford Motor Co. recently partnered with Silicon Valley 3-D printing firm Carbon3D to look for new and better ways to use 3-D printing, but the company’s technical expert in 3-D printing Harold Sears said that 3-D printing parts for mass production isn’t on the table yet.